Now in 2021, Alex Ferguson has a new job in Scottish football. Let’s take a look at Ferguson’s latest two seasons to see how he’s progressed. Two games into the 2019-20 season with two wins under their belts, East Stirlingshire must have had thoughts of a promotion push. Fast forward 10 games and they earned just two more points. This was enough for the board to sack Alex Ferguson. East Stirlingshire were predicted to finish in 6th position and after their 3rd place finish last year you could say that the prediction was perhaps too low in the table. Yet this 10 match winless streak saw the side drop to 15th in the league which was enough to see their manager fired. As you can see, East Stirlingshire did fight back after Ferguson’s dismissal and managed to finish in 10th place. Fergie, however, was unable to find managerial work and remained jobless for the rest of the season. It took until late 2020 for Ferguson to be hired again. He was originally wanted by Annan Athletic in the summer of 2020 but they opted for another manager instead. This didn’t work out for them and after sacking their manager they approached Ferguson to become their new gaffer. The step up from Lowland League to the Scottish League Two is a welcome one for Ferguson due to the difficulty in earning promotion from the Lowland League. Annan were predicted to finish in 3rd position in League Two and were 6th when Ferguson joined. He failed to improve the position of the club in his first season but will be optimistic moving forward. Alex Ferguson won’t be able to look at his managerial stats with pride after four years in management. But the young boss believes in his potential and will not stop fighting to improve his ability. He’ll be hoping for a successful stint with Annan Athletic before he moves on up the managerial chain. Four years into Alex Ferguson’s real-life career he was on the verge of joining Aberdeen in the Scottish Premier League. On FM, he’s made it to the Scottish League Two. 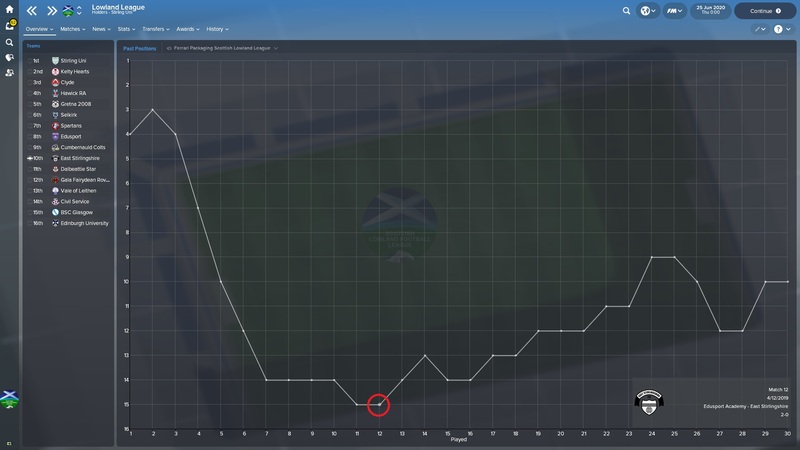 As you can see Fergie’s third season was a write off after being sacked by East Stirlingshire. He left the club in 15th place despite being predicted to finish in 6th. With Annan he will be desperate to exceed expectations to prove his ability as a manager. He is slowly improving his current ability and has now reached 119 (his potential ability is 200). If you liked this post, please do leave your feedback in the comments! Will Ferguson make a success of Annan Athletic? Can he put his torrid season with East Stirlingshire behind him and learn from his mistakes? 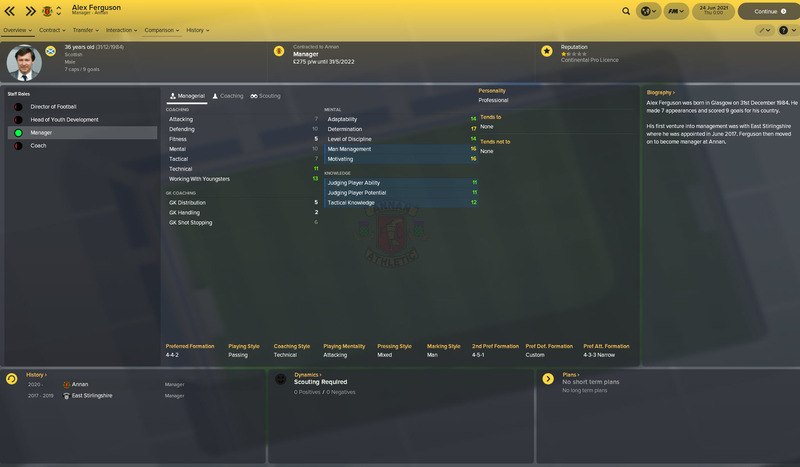 This entry was posted in FM Experiments | Sir Alex Reborn, FM18 Guides, Experiments & Wonderkids, Football Manager 2018 and tagged alex ferguson, annan athletic, east stirlingshire, FM Experiments, fm18, football manager, scotland, scottish league two. Bookmark the permalink.